Making Sense was a project funded by the European Commission within the H2020 Call ICT2015 Research and Innovation, under the CAPS “Collective Awareness Platforms for Sustainability and Social Innovation” programme. It was designed to show how open-source software, open-source hardware, digital maker practices and open-source design could be used effectively by local communities to appropriate their own sensing tools to make sense of their environments, and address environmental problems, mainly in air pollution, noise and nuclear radiation. 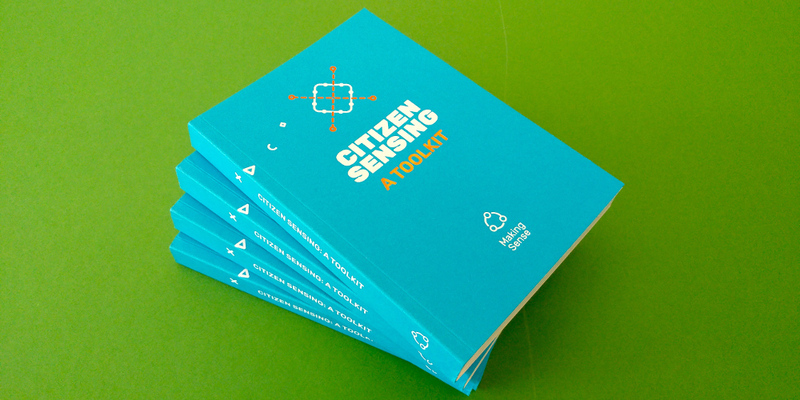 Based on nine elaborate pilots in Amsterdam, Barcelona and Prishtina, Making Sense developed a toolkit for participatory sensing, aimed at deepening our understanding of the processes which can enable collective awareness for sustainability. The toolkit consists of hardware, software and guidelines. The pilots have led us to develop a conceptual and methodological framework for participatory environmental maker practices, which we call “citizen sensing”. This framework acts as a guide to providing citizens, communities and middle ground organisations with the tools to enhance our everyday environmental awareness; in turn, these tools enable active intervention in our surroundings, change in our individual and collective practices, and ultimately, a hands-on transformation of the environment in which we live. We have brought the learnings of the project together in a Creative Commons licensed, on-line and printed book containing the Making Sense framework, 25 tools, 6 cases, multiple portraits and seven key insights. The book was authored by 23 researchers and practitioners. Furthermore, we updated the Smart Citizen Kit and its platform. Making Sense ran between 2015 and 2018, and combined the efforts of Waag Society; University of Dundee; Fab Lab Barcelona at the Institute for Advanced Architecture in Catalonia; the Joint Research Centre of the European Commission; the Peer Educators Network, and University of Twente. Making Sense was funded by the European Commission within the H2020 Call ICT2015 Research and Innovation, specifically under the CAPS “Collective Awareness Platforms for Sustainability and Social Innovation” programme (grant number 688620). The Making Sense Team is comprised of activists, artists, critics, designers, makers, programmers, thought-leaders and researchers that together have extensive expertise and hands-on experience in citizen science, as well as in developing technology for social innovation and empowerment, aka Digital Social Innovation. They have initiated and taken part in previous European projects that put people, their desires, needs and abilities first in developing new applications of mostly open source hard- and software. Making Sense brought them together based on their complementary skills, and a shared passion for providing tools to enable communities to rise up and take ownership of their data, their city and their collective future, based on a sound integration of public research and practice. Stefano Bocconi was born on the 12.10.1967 in Florence, Italy. Stefano has worked as a researcher in computer science in the Netherlands at TU Delft, VU University Amsterdam, and Elsevier Amsterdam and in Italy at the University of Turin. He has worked as a software engineer at Lucent Technologies and other companies. He obtained his PhD Automatic Generation of Video Documentaries at CWI, Amsterdam in 2005, and has a masters degree in Electrical Engineering from the University of Florence, Italy. Susana Nascimento is a Policy Analyst at the European Commission, Joint Research Centre, EU Policy Lab / Foresight, Behavioural Insights and Design for Policy Lab Unit. She is a social scientist interested in qualitative approaches to engage a broader, collaborative and inclusive range of people in creating new solutions for complex issues. Specializing in science and technology studies, her recent focus is on future oriented technology, blockchain and DLTs, transdisciplinarity, codesign for policy innovation, open science and technology, maker cultures and citizen engagement. Prior to joining the JRC she worked as researcher in CETCOPRA / Centre d’Etude des Techniques, des Connaissances et des Pratiques, CIES-IUL / Center for Research and Studies in Sociology, Vitruvius FabLab, and IPSC-JRC / Institute for the Protection and Security of the Citizen. She holds a PhD in Philosophy from Université Paris 1 Panthéon-Sorbonne and a PhD in Sociology from ISCTE-IUL / University Institute of Lisbon under joint tutorship. She held prior research positions working on human-computer interaction, AI and robotics, phenomenology, cognitive and life sciences, science fiction cultures, ethics and values in technology. Drew Hemment is an artist, curator and academic researcher. He is founder and Creative Director of FutureEverything, and a Dundee Fellow, Reader at Duncan of Jordanstone College of Art and Design, University of Dundee. Drew is currently leading the FAULT LINES talent development programme for artists in technology innovation (Ambition for Excellence). He is Artistic Director of the FutureEverything Festival, Manchester’s digital culture festival since 1995, and was commissioned by the Singapore Government in 2015 to curate FutureEverything Singapore, the flagship digital culture component of the 50th anniversary of the founding of Singapore. He has introduced art and culture into the flagship IoT and Smart Cities programmes of the UK (CityVerve) and EU, and is Coordinator and Project Lead of the GROW Observatory, a Citizens’ Observatory funded by EC Horizon 2020. Over 20 years, his work has been covered by New York Times, BBC and NBC and recognised by awards from the arts, technology and business sectors, including the Lever Prize and Prix Ars Electronica. He is on the Editorial Board of Leonardo. Journal of Art, Sciences and Technology, and was a leadership role-model on a pilot leadership programme for the AHRC. He was involved in seminal events in 1980s dance culture, and in 1990 was the DJ at the biggest peace time mass arrest in British history. In 1999, awarded a PhD at Lancaster University, in 2010 an Eyebeam resident (USA), and in 2009 elected a Fellow of the Royal Society of the Arts (UK). As Head of Programme at Waag Society, Ivonne investigates how we can make citizens resilient to the onset of smart city technologies. By raising awareness about the risks for society, she hopes to empower people and help them to create viable alternatives. Although we should not be naive about the way our personal lives and democratic structures are being influenced by centralized and closed technology, she is optimistic about the different ways people are finding to harness the same power for social innovation and the common good. Coming from an interaction design background she has been a project manager, project developer and team leader for many years in the ICT and innovation domain. Her expertise lies in understanding the uncertainties disruptive technologies can bring and building practical bridges between the different stakeholders involved. Whether this is through agile development approaches, co-creation workshops, hackathons, manifestos, labs, pilots or other types of creative research. As Head of Program at Waag Society she has led large European projects like Apps for Europe and is now spearheading the Smart Citizens Lab. From the beginning of the Open Data movement in the Netherlands she have been a vocal advocate of Open Government practices, through projects like Apps for Amsterdam, Code for NL, Making Sense, Clarity and E-Dem.nl. She specialises in the way peer-to-peer technology and bottom-up participation influences the policy making process. Currently she is a board member of the ISOC foundation and Code for NL and is a mother of three children. Frank Kresin (b. 1972) is the Managing Director at the DesignLab at the University of Twente. The DesignLab is the creative hub of the University, where academic research and societal challenges meet, mediated by design processes. He has been trained as a film maker, and earned a Master’s degree in Artificial Intelligence in 1997. He worked as a film maker and designer at the University of Amsterdam, and was a programme manager at the Digital University consortium. From 2006 until 2016, Frank has been affiliated with Waag Society, first as a programme manager, and from 2010 as its Research Director. He was responsible for Waag Society’s research programme aimed at developing and questioning technologies to address a wide range of societal issues. Frank has been involved in a great number of projects and programmes focusing on Creative Care, Future Internet, Maker Movement, Smart Cities and Smart Citizens. He is the co-founder of Apps for Europe, City SDK, CineGrid, Code 4 Europe, Digital Social Innovation, Making Sense and the Smart Citizens Lab. He regularly publishes on transdisciplinary research in the creative industries and he gives presentations on this topic. Furthermore, Frank is a board member of the Dutch The Internet Society and The Mobile City, and serves at the supervisory boards of Tetem and V2_, Institute for Instable Media. Alexandre Pólvora is a Policy Analyst and Researcher at the EU Policy Lab of the Joint Research Centre, European Commission, with current focus on participatory and distributed technology models and collaborative and transdisciplinary frameworks for policy advice. Main research and publication fields ranging from everyday life studies and qualitative social analysis to co-creation and action research. He was previously Researcher at CETCOPRA of Université Paris 1 / Panthéon- Sorbonne; Associate Researcher at Vitruvius Fab Lab, and at the Centre for Research and Studies in Sociology as MC of COST Action ‘Investigating Cultural Sustainability’, both at ISCTE-IUL / University Institute of Lisbon; Visiting Researcher at the Department of STS of Rensselaer Polytechnic Institute; and Associate Researcher and Consultant in participatory and community-based CSO/NGO projects at national and international levels. Mel Woods is Reader at University of Dundee where she develops highly collaborative and interdisciplinary approaches to practice in the Creative and Digital Economy. A central research interest is in designing for creative intelligence with a focus on people, future technologies, societal challenges and change-making. She is passionate about issues of environmental concern at local and global level. The CAPS EU funded project Making Sense, coordinated by Stichting Waag Society, shows how citizens can use open source technology and open sensors to collectively act at the civic level. Making Sense developed an easy to install Toolkit—including a sensor kit and a data platform—which allows citizens to collect, share, and interpret open data about temperature, humidity, noise, and air quality. The project enables citizens, city halls, and communities to use data for the common good, since it can improve citizens’ environmental awareness. The smart Citizen Sensing Toolkit fosters citizens’ engagement in solving urban environmental issues they care about. It also facilitates their collaboration with experts and technologists to achieve positive change through real world pilots.